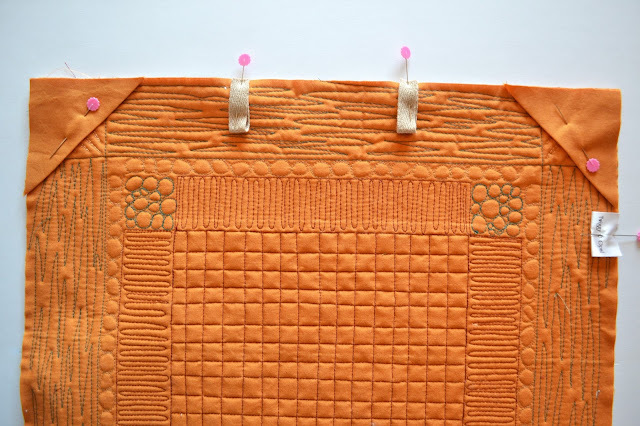 I have been asked many times about my method for hanging Mini Quilts, so I thought now was a good time to share my method with a quick and simple tutorial! I've been using this hanging technique for a couple years and love it! Not only is it easy, but your mini will hang flat...no drooping corners! While working on a quilt made of scraps, I had enough scraps from scraps (?) 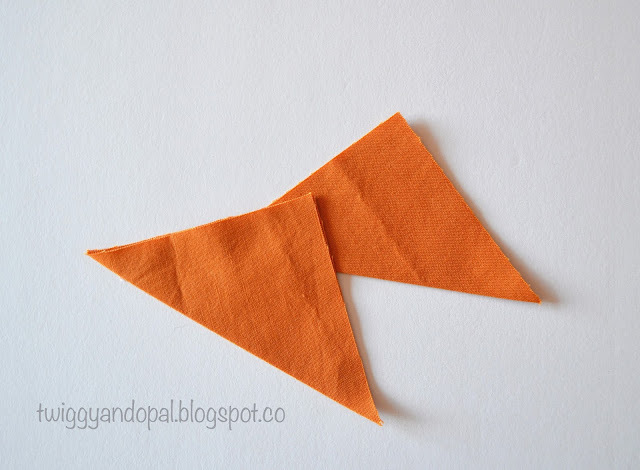 to make a mini quilt for this tutorial! Naturally you will need a quilt to make this tutorial work! Cut 2 - 3 1/2" squares and 2 - 3" twill tape. You can use any width of ribbon or twill tape. Mine happens to be 1/2". Fold your squares in half and press. 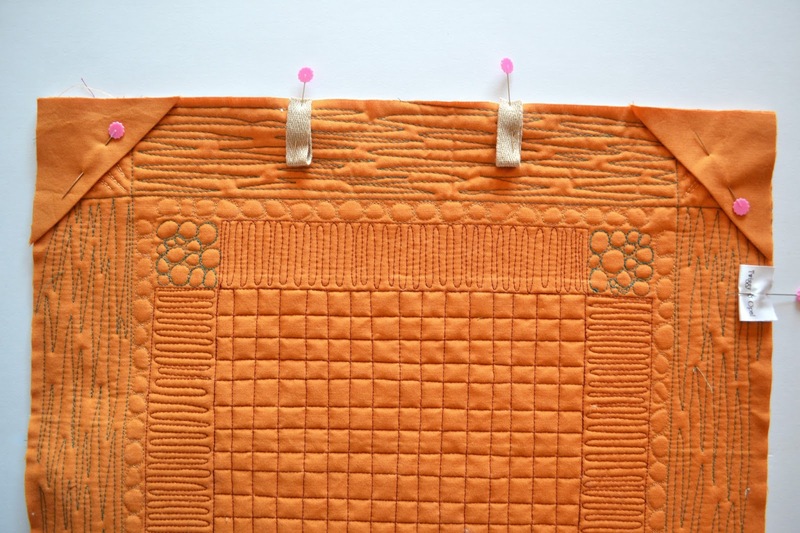 On the backside of your quilt, place the folded squares in the top left and right corners of your quilt and pin in place. Place your ribbon approximately 2 1/2" on either side of the center of your quilt pin. (Placement will depend on how big your quilt is) The ribbon pieces will keep your quilt from pulling away from the board, keeping it flat and perfect. I don't tack the twill/ribbon down at the bottom. The smaller ones stay nice an snug to the board. If you use tags, now is a good time to add that too! Stitch 1/8" around to secure the pinned pieces. 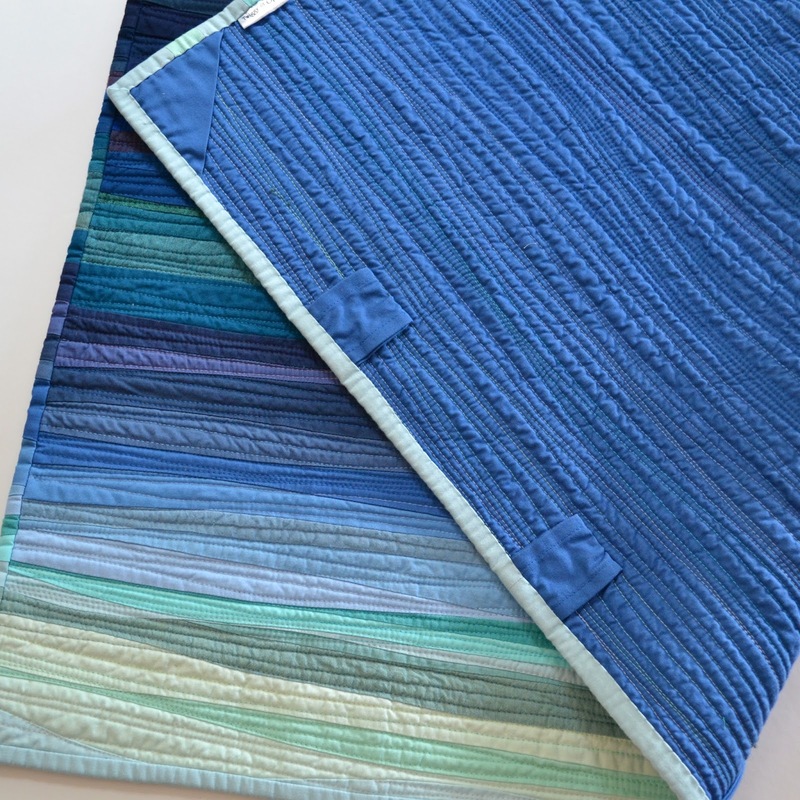 Finish your quilt by adding the binding in your usual method. Next, the wooden slat! If you wash your Mini's, do so before you cut the piece of wood to allow for quilt shrinkage. I use a couple different sizes of wood. Both are less than 1/4" thick, and either works perfectly well. I get my pieces at Home Depot, but I'm sure there are other sources that carry the same thing. The first piece is a precut 4 foot length. The second piece is used as screen door trim, and comes in all different lengths. 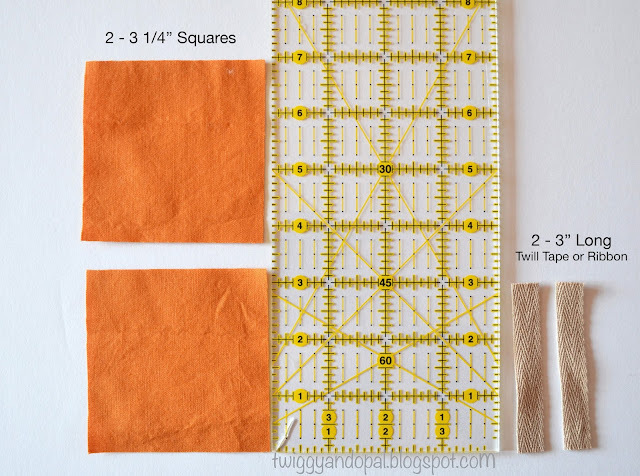 Measure across your quilt from just inside your binding and subtract 1/2". Mine was 14 1/2", so I want the wood piece to be 14". This will still keep your quilt flat, but also allows for a little wiggle room to adjust for hanging. Mark the center of the board, drill a small hole and viola! you have the perfect hanging system for those amazing mini's! Before you drill the hole, make sure it's large enough to fit over the head of the nail you will be using. I have my husband deal with the cutting and drilling for me, not that I couldn't do it...he just likes to feel needed sometimes! 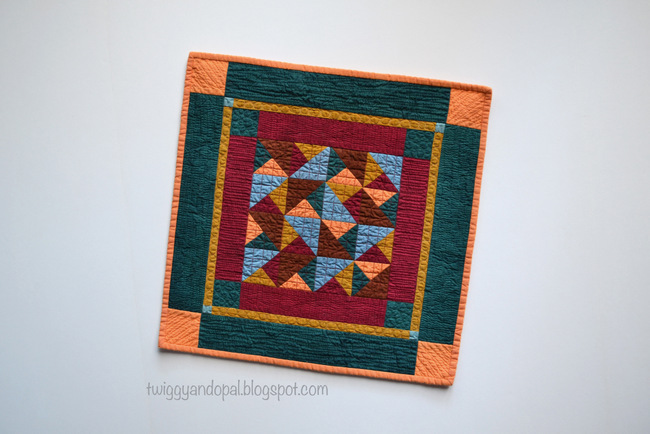 There are many different ways to hang mini quilts/wall hangings. This one is my favorite and works the best for me. I used a modified version of this method for a large 3 foot wall hanging. Instead of ribbon, I made four 'hanging sleeves' from fabric across the top. I did tack them down on the bottom because they were bigger and I didn't want any issues. I hope this is a useful tutorial! Do you have a favorite method to hang your Mini's? I would love to hear what it is! I'm glad you posted this. I had been meaning to email you and ask you about it :) This looks so much easier than doing a hanging sleeve. I was hoping my method would be helpful! Hanging sleeves are great for big quilt, but smaller ones not so much (in my opinion). I like that there isn't any drooping, and that it's easy! I think this is a fantastic solution. I use thumb pins and think I should be doing something nicer. I've also debated just running wired along the wall to clip to. It works great for me and it's so easy! I like my mini's to hang flat. This took care of the drooping corners perfectly! I love the wire idea, that would work and look really nice. Nice! Thanks for the tutorial! Thank you! Something simple and effective…no more sagging, drooping mini's! This is so nice and neat. My hanging sleeves are always messy because I'm in a big hurry to get them done. I need to take a lesson to take pride in the way the back looks. What is the nail like that you hang them on? If this wasn't so easy I would just stick a tack through the quilt! I use tiny nails or picture hanging hardware (Including a picture). 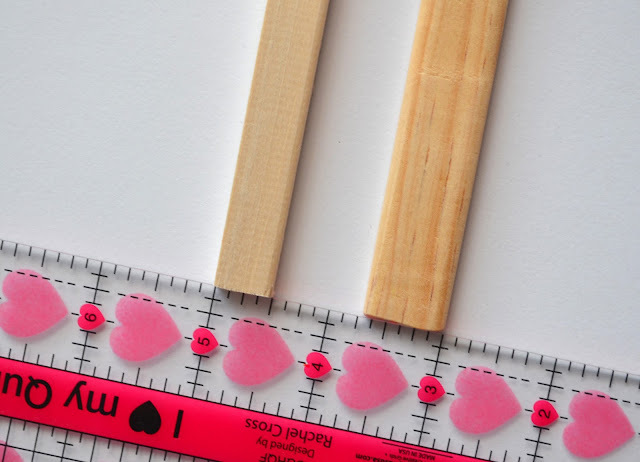 You would want to make sure the hole is large enough for the nail you would use. One of my LQS uses used machine needles to hang their quilts. They just hammer them through the quilt. But with your wooden bar you could use them as the "nail." I have never heard of using machine needles! How clever is that?! They would work perfectly well! Thanks for the tip Linda!! Do you sew the ribbon down to the quilt at the bottom? Good question Vicki! For the small ones, I don't. It stays snug against the board. When I do bigger ones and use fabric instead of the ribbon, I do tack the bottom down. Thanks for the tutorial. 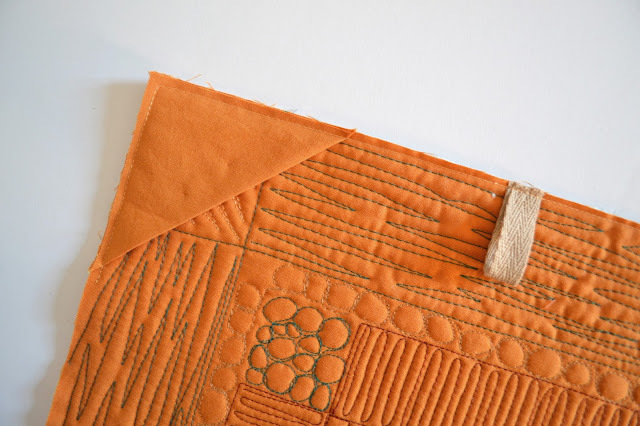 I do something similar -- the corners but use a round dowel and not the pieces of twill. Your mini looks great. 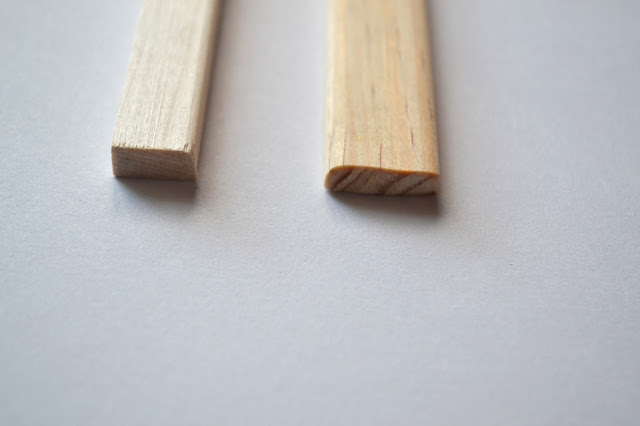 A dowel works perfectly fine too! 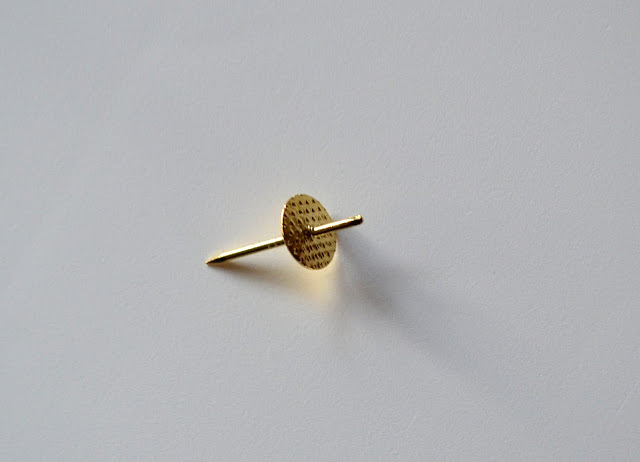 I like to have a hole for a small nail, and a dowel would not be fun to drill in to! So one nail to the wall and hang, is that all I need? 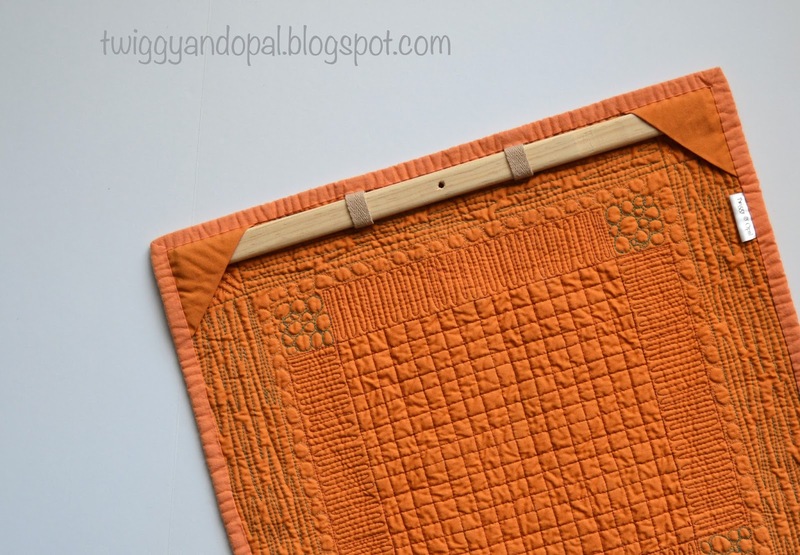 How big quilts you have hang using this method? Thanks for this. I have found that one nail on the smaller ones works just fine. The biggest I have done is a 3' in length with this method. I drilled a larger hole and hung it on a bigger nail for more support. Not that it was horribly heavy…just didn't want to take any chances! 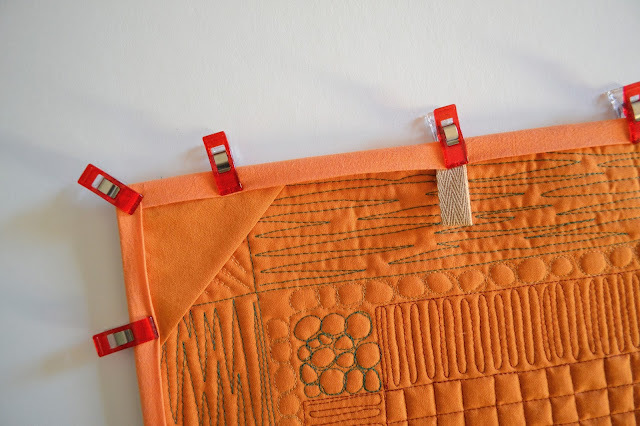 I use the Command picture hanging strips for my small quilts. When I first tried it I wasn't sure the strip would stick to the fabric but they are all still hanging. Easy peasy! I've used your method for a couple larger wall hangings and love how easy it is. I've never used those strips for quilts, but have heard about them. It's good to know that they actually stick to fabric and hold up to the test of time! Thanks for the info, I may give them a try for my mini mini quilts! Thanks for the run-down of your process. I've used similar steps but I added a full hanging sleeve to the mini (that's what I was taught and I didn't know I could break the rules!). My trick is to use a paint stir stick as it is super flat and very light weight. I will go back and drill the centre hole in the wood though, that's brilliant! And should have been obvious too. What a great idea with the paint sticks!! I never thought about that…and they are free!! I think hanging sleeves are great for big quilts, but for smaller ones I don't see the point! Unless you are entering a show and it's required! Next time I'm near paint I think I'll grab a few paint sticks, just to have on hand! Thank you for the tutorial, I've used round dowel in the past, which does tend to show, so next time I'll got for the flatter shaped wood!! Thanks for the great tip! I was hoping this tutorial would be helpful! I don't know if there is a right or wrong way to hang quilts, but this one works great for me! I will try this. Thank you for the tutorial! I don't have many minis to hang but i have a wallhanging that i haven't put up. I didn't add any hanging sleeve or corners when i made it and i don't know how to add them retrospectively. Neat! Great idea with the ribbon. First I have to say that the quilting you did on this is scrumptious Jayne! The hanging tutorial is great too! I use old sewing machine needles too, if the quilt is small. The 3-foot quilt at the bottom of the post is beautiful. Did you blog about it anywhere? I'd like to see more of it and learn about your quilting decisions. Thank you for sharing your beautiful blog! Is There No End ? Diamonds, Triangles, Octagons...Oh My ! Rebuilding A Funky Stash !